Bobby Young to appear against Barrow Rangers. Young (l) is set to appear from the bench on Saturday. Another of Cramlington Rockets’ juniors is set to make the step up to the professional game. 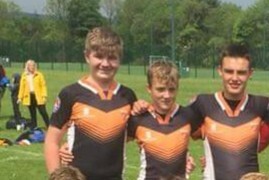 U16 Bobby Young earned a place in the Newcastle Thunder Academy last winter having impressed through the 2018 season. His hard work since then is set to be rewarded as he is named on the bench for the U16 Development Game against Barrow Raiders. The Championship side are travelling over from Cumbria on Saturday and will take on a Thunder squad that includes Benji Kinloch, another player who has risen through the Rockets’ junior system, and three players who have been called into the England Youth Development Squad. Kick off is at 2pm with entry via the Tap & Tackle in the East Stand.  New for 2019: Cramlington Rockets Club Calendar Never miss a event or fixture! New Rocket Tots Classes Released  Start this Saturday!